William G. Findley, son of Albert and Anna (nee Gray) Findley was raised at Lot 14 Concession 11 of East Nissouri Township. His father also served in WW11. In 1941 at age 16 he enlisted by fudging his papers. 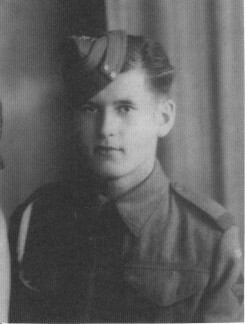 As a member of the 7th Medium Field Regiment, his job was to radio targets between troops, artillery, and planes. He arrived in Normandy a month after D-Day. His job there was to lay radio wires from a massive spool around the French countryside, while going through potential mine fields and avoiding friendly fire which was a leading cause of death. He was there when a Nazi concentration camp in northern Holland was liberated and couldn't believe the condition of those 500 prisoners. The prisoners were so hungry when they exited the gates that they started to eat leaves and many clung to trees to keep upright. Memories like this and the fact that he survived weighed heavily on him, so Bill was unable to speak of this horror for many decades. He has taught more that 40,000 teens to drive which is his way to help keep people safe. Originally from Kintore, in 2013 he lives in Courtland, Ontario, Canada.